Baliestraat 1, 8000 Bruges, Belgium. 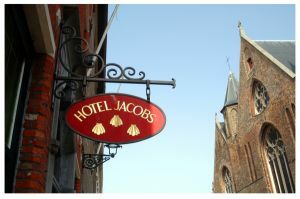 The delightful Gentile family owns this small and cosy hotel in Bruges and will do its utmost to make you feel at home in Bruges in their hotel 'Hotel Jacobs'. 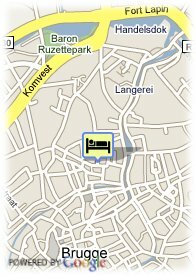 The hotel is situated in a quiet and picturesque area of medieval Bruges. The 'Markt' and 'Burg' square of Bruges and all other places of interest are all within walking distance. Behind the traditional gabled façade, you will discover a hotel with all modern comfort. All the rooms can be reached with the elevator. The spacious breakfast room, a peaceful lounge and a cosy bar will help you to relax during your stay in Bruges. WiFi is available free of charge.There are internetcomputers available in the lobby free of charge. Centre, Museum Area, Near the historic centre, Near shopping centre.